Sometimes I plan a lesson and it turns out to be a flop. But, there’s a way to flip every flop. This semester I’ve vowed to incorporate more activities that don’t require the use of technology in the classroom. Bingo seemed like a perfect start with my new third graders. However, I didn’t take several key factors into consideration. Most of my third graders don’t know the English alphabet yet, which means they can’t really read or write. Although they do a good job when it comes to speaking, basic key expressions have to be repeated constantly, and in a variety of ways. My co-teacher and I discussed the potential difficulty of this task just moments before class was to begin. We decided it would be best for one of us to write each name on the chalkboard as it was said, after the other asked every student, “What’s your name?” It took almost 20 minutes for students to make their Bingo cards, leaving no time to actually play the game. I suppose it wasn’t a total failure. Students did get the chance to practice dialogue a lot, but they were so confused and slightly disappointed when we had to end. I assured them we’d play the game first thing next class. After asking my other co-teachers for suggestions, I made several adjustments to try with the following class. 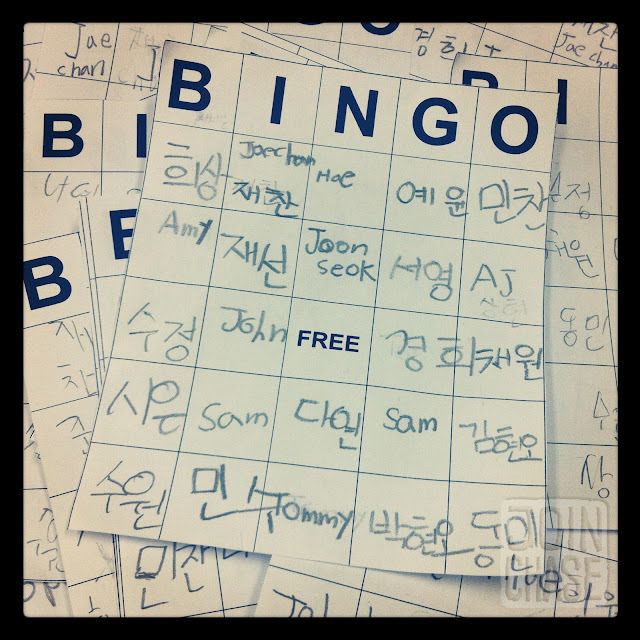 However, I didn’t think about the fact that Koreans might not play Bingo the same way I do (or at least my co-teacher for third grade doesn't). The way I described how to play wasn't what she translated. After a few rounds, some students started shouting, “Bingo!” Indeed they had either a horizontal, vertical or diagonal line as I described. But, my co-teacher told the students they must get all three lines in order to get a ‘Bingo'. After some quick and quiet debate, I backed down and went with the way my co-teacher stated. Once again the kids were confused, but thankfully one student managed to get a three-lined ‘Bingo’ just before class ended. Nothing ever goes according to plan. Not in class. Not in life. But, I’ve learned the best thing to do when everything seems to go wrong is simply appear to be in control, remain calm, and call the shots. It’s kind of like when you mess up when singing or speaking in front of an audience. A good performer knows not to draw attention to it, rather just keep going like it never happened. It’s all about how you react, and some people are better reactors than others. Flip a flop. Always learn from mistakes, and genuinely try to improve with every lesson. Turn a bad situation good. Happy flipping! Happens to me all the time. Just today I was playing the "I have never" game with my students using the past participle. This class in particular didn't fully understand how the game was played in that students should only change chair if they have done what the other student said he/she has never done. However, they ended up playing their way but were practicing making sentences and also having a good time. They even applauded at the end of the class. Even though a lot of things do go according to plan, some things don't. It's just how one reacts that can determine a positive or negative outcome. It truly is about flipping a problem and making it something postive and useful. Thanks Chase for sharing as always.